Canon Europe has unveiled its new Zoemini S and Zoemini C, follow-up products to the original Zoemini portable printer launched last year. The two new camera models feature an integrated printer that supports Zink adhesive-backed photo paper, enabling users to directly capture and print their images as small stickers. The Zoemini S is the flagship model, offering mobile app support and select other features the Zoemini C lacks. Although it's Canon Europe that made the announcement it was Canon Deutschland that uploaded an introduction video to YouTube. There's no audio, but the overlaid text is in German. 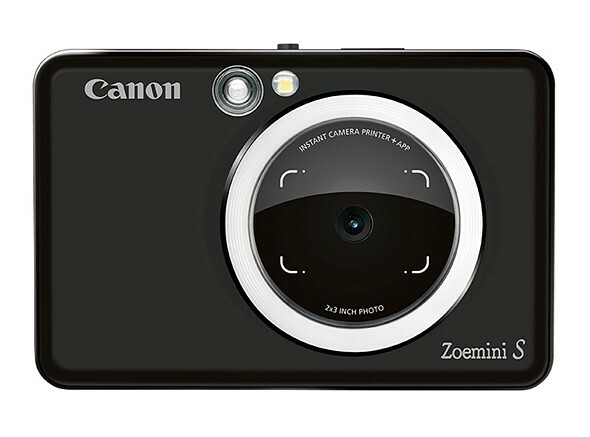 The Canon Zoemini S features an 8MP camera and a microSD card slot for directly capturing and storing images. 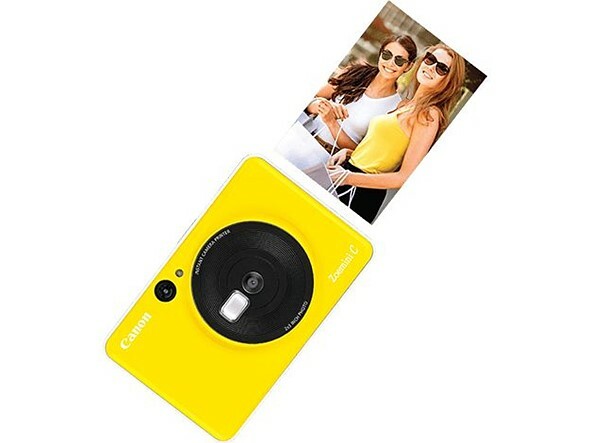 The camera itself is quite basic, featuring a front-facing mirror, ring light, Bluetooth connectivity, and an integrated Zink printer. 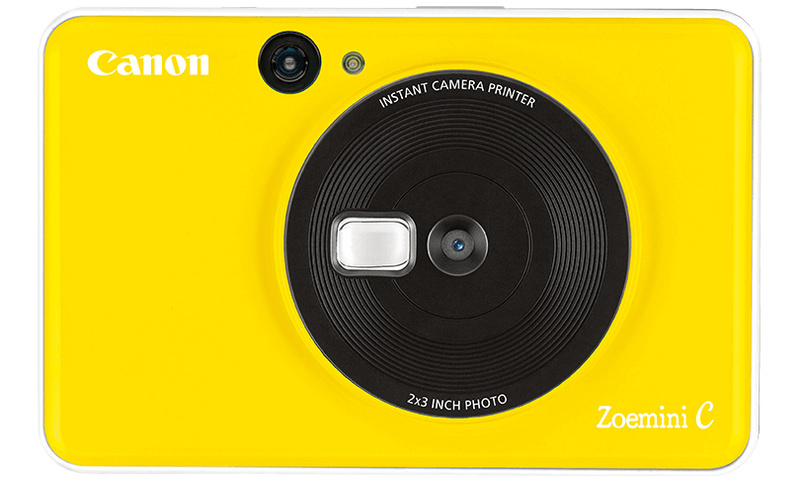 The Zoemini S model supports Canon's Mini Print App for Android and iOS, which receives images from the camera over Bluetooth. 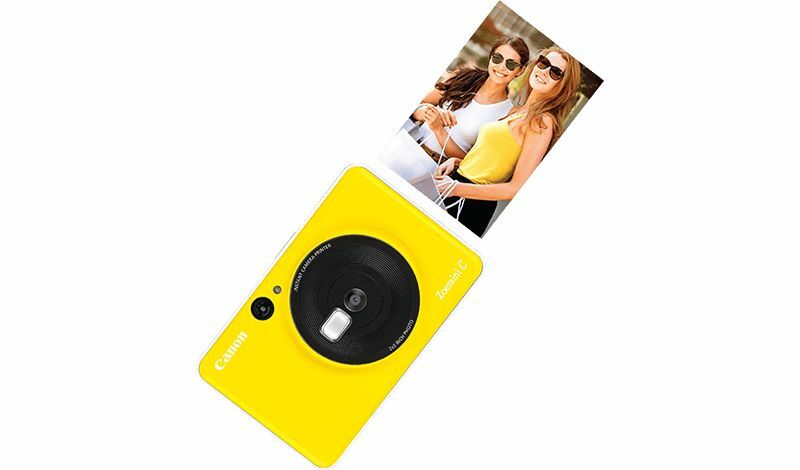 Device owners can use the app to apply image filters, create collages, and print 2 x 3in / 5 x 7.6cm photos, as well as remotely triggering the camera's shutter and setting a timer. The Zoemini S will be offered in Pearl White, Matte Black, and Rose Gold color options starting on April 25 for £109. Joining the Zoemini S is the Zoemini C, which features a 5MP instead of 8MP sensor alongside a microSD card slot and integrated Zink printer. The Zoemini C model likewise features a front-facing selfie mirror, but does not feature a ring light or support the Canon Mini Print App. The Zoemini C will be offered in Bumblebee Yellow, Bubble Gum Pink, Mint Green, and Seaside Blue colors starting April 25 for £149. Both camera models will be shipped with 10 sheets of Zink adhesive-backed photo paper. Update (March 28, 2019): In the United States these two cameras are being sold under the names Ivy CLIQ and CLIQ+ for $100 and $160, respectively. The specifications and details remain the same between the CLIQ and Zoemini camera systems. I have both Zink and a Fuji Instax and their is no comparison. Instax prints are simply beautiful, the Zink is quite lacking by comparison. The Ivy (named for U.S.) printer is priced the same as the lower end camera at around $100. I am curious to find if they can, in fact, accept photos from phone like the stand alone printer. If it does, Im curious if price for the printer will come down. Also, curious if the printers are going to be same quality between the stand alone, the S, and the C?? Have I got this right - the S is the more advanced one, with 8MP and ring light, but is £109, as opposed to £149 for the lower-spec C? I think they may have gotten those backwards. "the camera itself is quite basic"
Dang how is a ringlight and printer "basic". What other cameras have a ring light and printer.... built in? The cost seems a bit less than fuji too. I'm seeing 50 prints for $25 for the canon and 50 for $32 for the Fuji. For a change , this camera looks compact and frienly enough to become childs' "first camera"
How much is the paper? $.55/shot? At that price I wouldn’t let my grandkids anywhere near it. This will join the Instax in the crap drawer an keep it nice company. Canon wants a slice of the 'disposable dollar' product market. Of course Canon does, because the Instax cameras have and are selling very well. This camera will also sell well. I might can one myself to "break the ice" in people photography. "Disposable dollar" products are all over the place from napkins to $1 disposable lighters. What about "disposable dollars" in expensive cameras that are underutilized? I have 3 Instax cameras and like/use each one. I may get one of these as well. Some of us like using products like this, just for fun. I'm not normally a rabid save the planet guy, but surely there needs to be some self restraint when it comes to making things that are just going to get used once and then go straight to a landfill. Oh come on, I'm sure it will get used at >least< 10 times before it gets tossed. Otherwise, I am with you on that general sentiment. At some point in the the not too distant future we will be forced to once again build sustainably, just as in Ye Olden times. Else get wickedly good at recycling our trash into the products we want. That's not hippy drippy fear mongering. That's hard number on a graph. Those commenting about IQ are missing the point. These cams can be very useful for situations like mine where I hike in places with no internet and meet people who would love a photograph or two. Example: A 12km hike from Kunjapuri temple in Rishikeh India that took me through several lovely small villages and kids were enamoured with my smartphone. As soon as they saw my phone, they said "selfie!!" and played with it taking photos. Wish I had a small camera/printer at that time (2016) to give a few photos to them. I was pleasantly surprised that even though they didn't have internet or a smartphone, they knew what a selfie was. Google for "kunjapuri trek in rishikesh" to see what this hike is like. I have the original Polaroid, but too bulky. Fuji Instax and this new Canon seem to be more portable. No dual card slots? I'm out. And what about the Dynamic Range ? Are you saying the new super cam phones are going to also come with this printer inside???? LOL. It could actually happen! LOL. The i-print! WE HAVE NOW SEEN THE FUTURE! Can these things print from a phone image or not? I get it supposed to be a camera but to me this is more of a portable printer for parties and such that compared to other similar devices also has a camera that may add a small additional value for nominal cost. Yeah I have the printer only (I acquired for next to nothing) and that's what it does. I recommend that instead. It's like a tiny, double thick cell phone(size) and wireless(Bluetooth with lithium ion battery). There are already portable printers for that. Canon clearly wants a piece of the instant camera market. Fuji Instax sells well. I like it. And I don't say that often about Canon products. Sure, it's as gimmicky as a Mickey Mouse dollar. But it screams fun. If they can deliver this for well under $300, and keep the costs of prints down, I think they have a winner. Yes exactly; but it does need to get down to 10 cents a print. The volume would more than make up for it. And folks would not be scared to buy more bulk. Which has to do with reliability of the printer. They need to send replacement out quick if they fail. Else people will not keep buying Zink paper. No ink to buy is huge. Keep cost of paper and printer low and this might survive. Ewww. Retail. That can kill it. If you bought this you'd have devices. Your phone and this. If you bought the (Bluetooth wireless) mini printer then you'd still have two devices. Your (likely better camera) phone and this. I have the mini printer, practically free; from someone who could not abide the app. I agree cheaper would be even better, but I'm quite certain this product is designed on the inkjet model. The camera is a loss leader and the paper is the profit. I'd be very surprised if the paper were offered any cheaper. Maybe >IF< this concept took off and everyone started offering similar products. But I doubt that's going to happen. This is a niche product at best, a curious side path along the road of photographic technology. It's a fun little side path but nothing that's going to shake the foundations of the industry. I certainly wouldn't buy this as any sort of long term strategy. It's a gimmick, and a pretty good one at that. The whole instant print redux we're seeing could run its course in 2-3 years and be forgotten without anyone blinking an eye. I still think it's a fun little camera. I just noticed only the "C" will be available in fun colors, while the "S" will only be offered in what are presumably grown up colors. Well that's not very fun. I don't know. If 5x7 paper for this was inexpensive it couldn't lose. This will be an exercise in greed and IP battles. But if some company keep the printer and paper prices way down then volume can make them a huge success. Will they try that? Probably not. Just think of Bill (Bilminda) Gates and the small (what $25?) Microsoft tax. Did that make him any cash? Would you buy it, after seeing a demo (clear photo with no ink to buy); for $50 with 100 wallet size Zink papers included, to start off? Then order $10 per 100 small sheets ongoing? How about $100 (printer) with 100 4x6 sheets? 25 cents a 4x6 sheet and there after. You'd have some folks printing out all their stored photos for a change; then. And aren't poor quality Polaroids selling (some); even costing a lot more? Are you suggesting Canon sell this camera for $50, including 100 sheets of paper? Did I get that right? Sure, I'd buy 3 at that price. I'd even take 'em in Pink. But I don't think it's going to happen. Zink could sell printers in volume levels. And start with orders; to be safe. If it didn't work. 1. Step one: Make a news video and get it into the eyes of everyone; clearly showing the quality detail. With no doubts. 2. Explain the bargain, no ink to buy printer paper, discounted starter bundle. 3. Promise 10 to 25 cent per page (100 packs?) of Zink (zero ink) paper; depending on size. The 2x3 sold as REALLY inexpensive. It will work. And if it Zink did not get the volume orders then they only have to make what's ordered. It's not even the cost of prints that concerns me now, it's the ability to get prints at all. I tried to get a roll of film developed recently, and it took FOREVER to find a place to just drop off the film, and it took a couple weeks to get it back, and a single roll of 24 prints cost like 16 bucks. I hadn't tried to get film developed in at least 10 years and was just kind of shocked how hard it is. So yeah, an instant camera is appealing to me now. I always say do a little film. A lot of "digital". Maybe the thing to do is buy a $25 chemical kit and tank to do a few rolls together at a time. It's cheap but requires just a few minutes. Reuse stuff too. ...It's kind cool and you can preset the white balance to the orange part of the film and after post inverting get the films native colors/look. But then it's a know-how thing in Gimp (Gimp pimp it for free; never photosnot); where you are expanding the (negative films) compressed DR. That's why negative film has such exposure latitude. About 4 stops! Use the curves in Gimp and even droppers to tag your highs to shadows and it will expand it for you. Don't give up until you learn how to make it look right. Which may take you a few times; but then your good. Note I use ufraw for automated (setup custom per my camera body once) Raw dev. But Darktable works too and many others (RawTherapee). Get Linux Mint going and get all open software to play with; without deleting anything you have now. Once digital you can print with one of these new zero ink paper printers. Or whatever else you can do with your files. And BTW you can by the cheapest negative film; because you can make it look like Porta 400 anyway. LOL. If you know what you're doing. GMIC a gimp free plugin has film looks and much more. These are things you just check the box, to install in Linux Mint (with Mate). Look it up. Practice digitizing some old negatives you already had developed. Too small of a print. I like my Selphy 1300 even though it is big, but still portable. Granted this isn't a D850; but hold on. I printed out a small Zink photo, of great total quality on their little pocket printer. It was really a nice quality wallet size photo print. Try it. See it. Putting it in a cam was inevitable and interesting; but printing from a higher end camera system (and technique know how) does still translate down; much of the goodness (not all). Wallet size is pretty forgiving; in some ways also. I haven't seen the slightly bigger format printer. Stop the marketing BS. All you'd have to do a show a real photojournalist clear video news style report of the print; as it actually comes out. From the photo taken in camera; for this case. If that isn't good to show then you know it's the camera body and not necessarily the Zink printer. Zink paper must be really, really cheap or it will die; as yesterdays old new really, really quickly. Even if the requirement of proving the printer output has been communicated. The faddish marketing BS needs to stop. People are also having frustrating trouble understanding the free required phone app. Many just give up. I worked through it. But I'm a computer geek. Yeah, that sample print in the first photo was SURELY taken on this tiny sensor digital camera.